Sitting here with a broken foot during the climax of summer, leaves me no choice but to travel deeper into the roots of my family. There are so many pieces to the puzzles of our family that at every corner there is a supposition and a narrative. With tiny clues such as an address or a name, we finally build on a brief sketch that is our own. 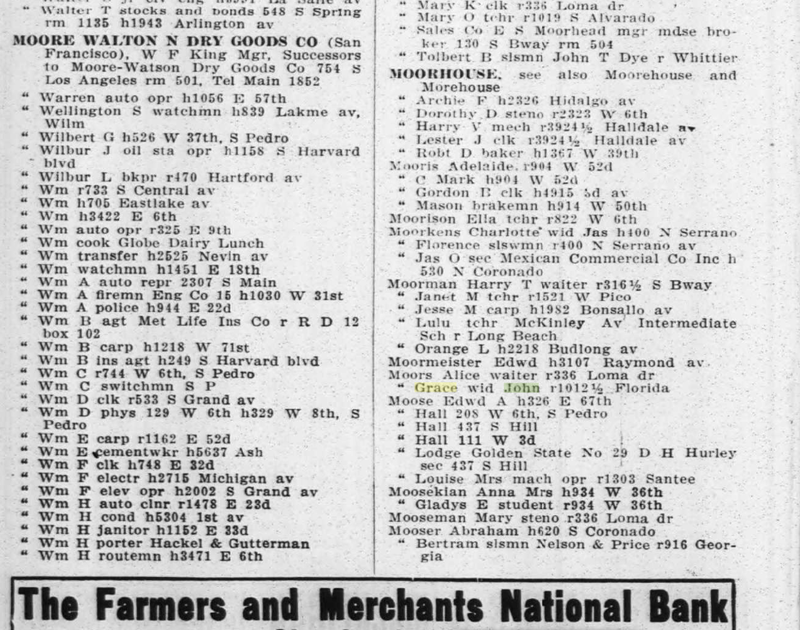 One of the intriguing links in my family would be that of my great aunt, Alice Moors, born in 1879, also in Lambeth, England. 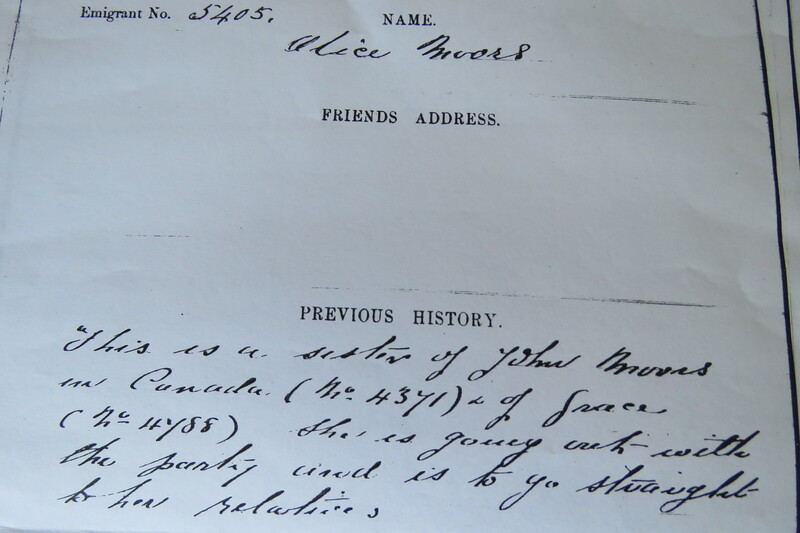 Baptized on the same day as her sister, Rose and brother (my great grandfather), John, on April 22 1883, Alice was yet another relation who traveled to Canada with British Home Children and the Annie Macpherson organization. 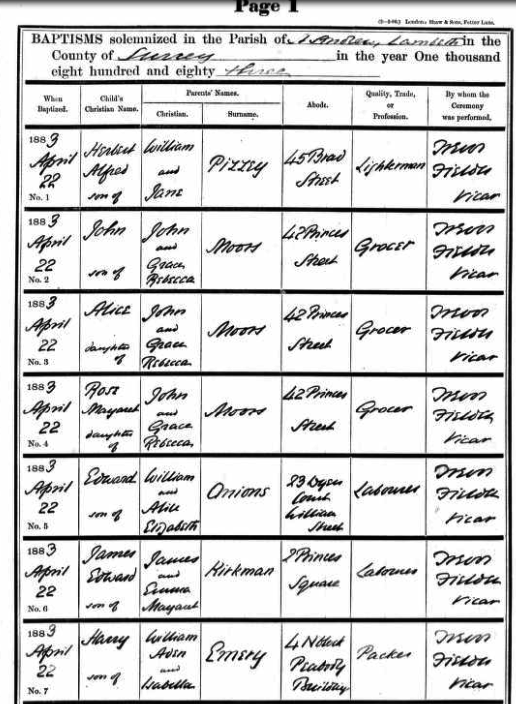 Raised in Lambeth by her grocer-father, John Moors, it was evident that there was a degree of privilege and an association with church that provided her cross-ocean passage with some family members, in order to visit young John who had been sent first as the young BHC, apparently to open up opportunity for the family. I find her on a manifest for the Dominion in 1899, the final voyage for a family that has found itself back and forth across the Atlantic multiple times. We see John, the Mrs., Rose, Ada, Grace and Alice and all are listed as servants and John, a farmer. From Bernardo’s records…a very sketchy record of Alice. 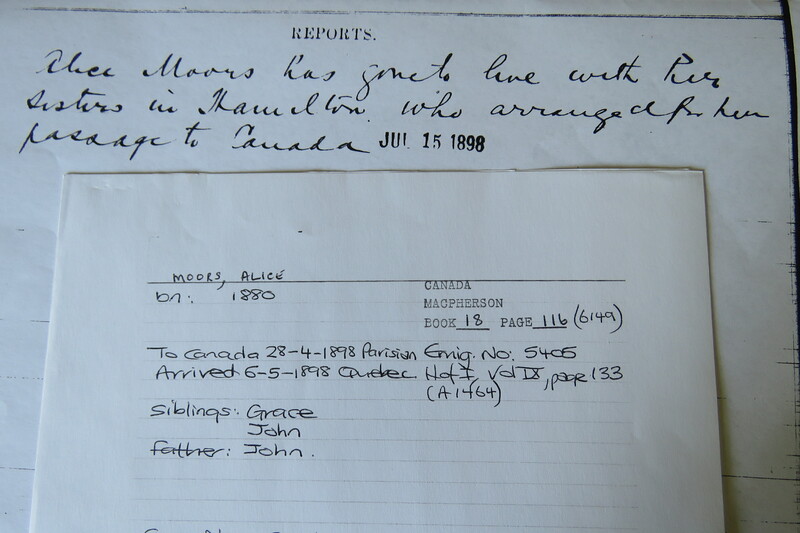 The fact that the documents mention sisters, leads me to believe that the oldest sister, Marian Ada, is already in Canada although I’ve never found BHC records or details of immigration that would support that. Of the sisters, Marian Ada is the one I know least about as she left Hamilton, married Chas Wood and moved to Crystal Beach, Muskoka. It has been my sense for quite some time, that at some point in history, Alice was discovered to have a mental/emotional disability of some sort. I find that it is interesting that the ‘previous history’ comments state that she “is to go straight to her relatives”. 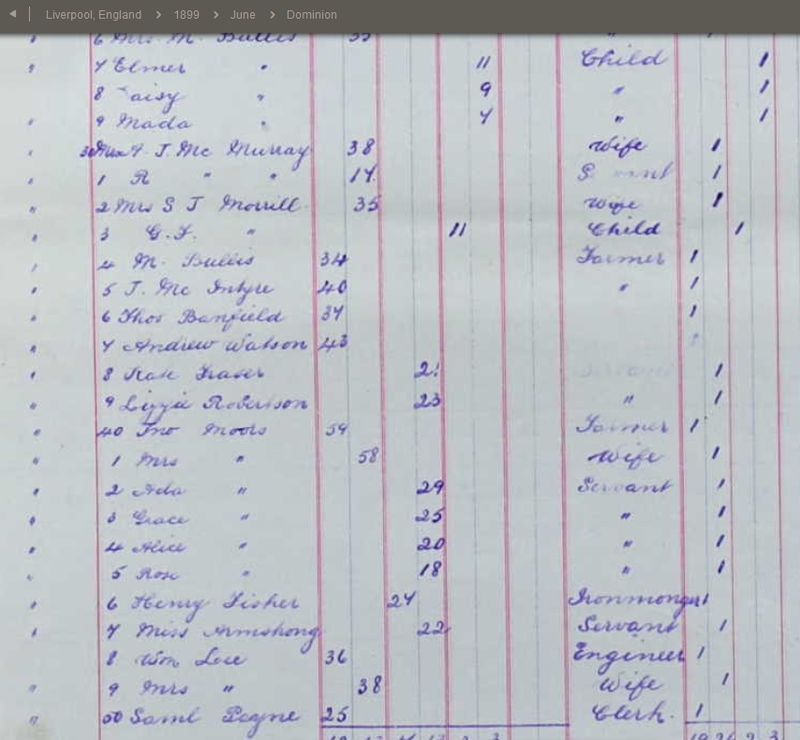 And yet, it is on the 1901 census that I find Alice working as a servant for the Gartshore family, another very well-to-do family in Hamilton. 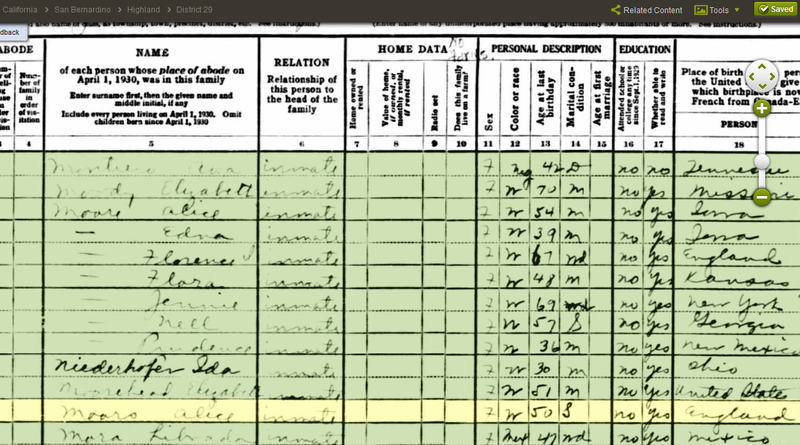 On the 1891 census, I find the Gartshore family claiming that the 11 year old, Frederick S. Chapman is their son. This is something that intrigued me along the way. Just north of Stuart Street is the CN/Southern Ontario Railway yard (formerly the Great Western Railway). Within the survey are 23 narrow lots (each 23-24 feet wide) and two larger industrial lots. One is listed as “Tool Company property” and the other “Gartshore”. John Gartshore (1810-1873) was one of the leading manufacturers in the country during the 19th century. He moved to Canada from Scotland in 1829 and after a fire destroyed his flour mill in Fergus, Ontario he moved on to Dundas. There he built a foundry in 1838 with James Bell Ewart and manufactured steam engines, mill machinery, and parts for the Great Western Railway. Between 1857 and 1859, Gartshore cast the boilers and beam engines for the Hamilton waterworks found in the Hamilton Museum of Steam and Technology today. In 1870, the foundry was sold to a local apprentice Thomas Wilson (Houghton, Margaret. Hamilton Street Names. Toronto: James Lorimer & Co., Ltd., Publishers, 2002). John’s son Alexander Gartshore (1839-1904) moved his industrial efforts to Hamilton and formed a partnership under the name Gartshore & Cowie, acting as the first iron pipe manufacturer in Ontario. Alexander Gartshore soon acquired full control of the foundry (Cochrane, William. The Canadian Album: Men of Canada. Vol. 1. Brantford: Bradley, Garretson, 1891.) This was likely the earliest period in which the survey may have been drawn. The company was eventually named the Canada Pipe Foundry and subsequently the Gartshore-Thompson Pipe & Foundry Company. These cast iron pipes connected Hamiltonians with water, sewer and gas lines and helped to build the infrastructure of the city. The company was purchased by Canada Iron Foundries in 1939 (Gartshore Ian and Sandra (Gartshore) Jernigan. 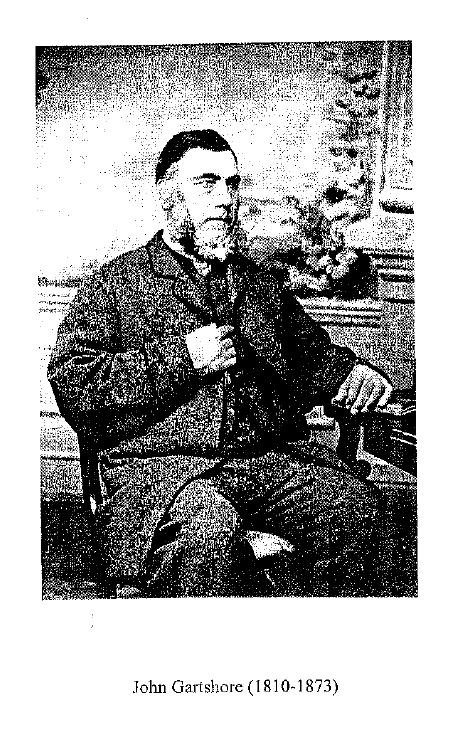 An Engineering Entrepreneur in Early Canada: John Gartshore in the 1800s. Kingston, The Engineering Institute of Canada, 2003). In nearby Pier 4 Park on Macassa Bay is found the Gartshore-Thompson Building (ca. 1900), a relocated historic building that once acted as the offices for the Gartshore-Thompson Pipe & Foundry Company (Brooks, Ivan. Hamilton Harbour: 1826-1901. Halton Hills : Maritime History of the Great Lakes, 2001). 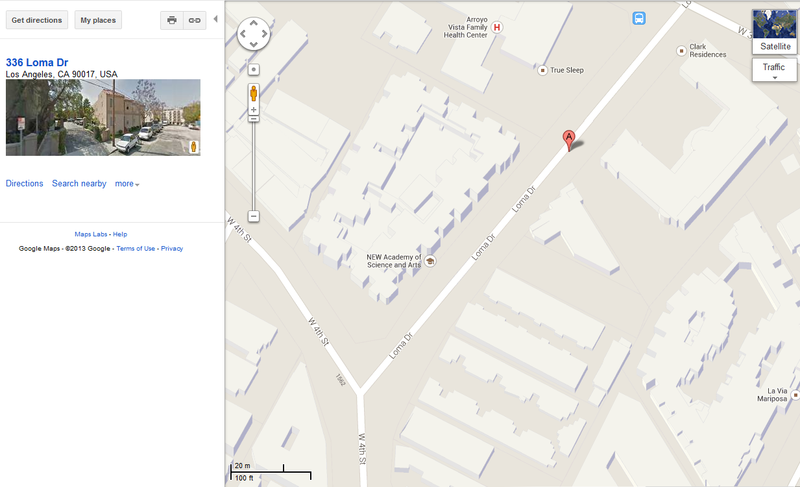 The “Tool Company property” shown on the map was the Hamilton Tool Works Company founded by William Hendrie in 1872. 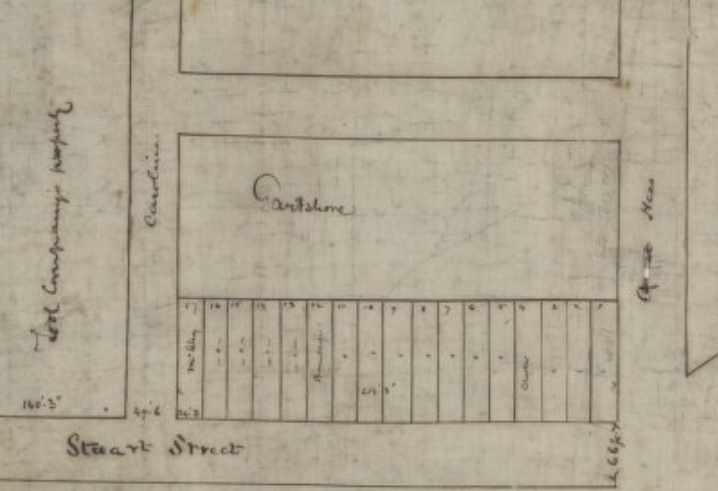 The Hamilton City Directory from 1874 shows the company as being located on Caroline and Stuart Streets. In 1881, the company was reorganized as the Hamilton Bridge and Tool Company (Burely, David. William Hendrie: The Dictionary of Canadian Biography, online edition, 2015). Due to its proximity to the rail line, the company started making railway bridges and was renamed the Hamilton Bridge and Tool Works and then again the Hamilton Bridge Works Company Limited (H.B.W.) in 1894. (Hamilton Special Collections. Industrial Hamilton: The Trail to the Future, Hamilton Public Library, 2001). Son of John Gartshore, Alexander was a prominent figure in engineering in the Toronto Dundas and Hamilton areas. 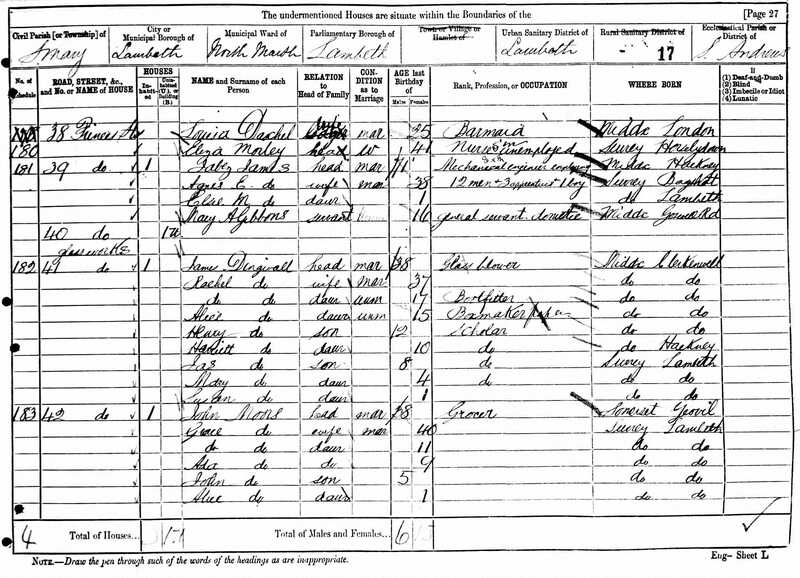 No where in the writings or biographical information, the most detailed being found here, do I find any mention of the domestics of the household in Hamilton. Not surprising…but, our Alice was working in their home, along with others. Alice is found to be witness for her sister, Rose Margaret Moors on her wedding day to Harry Clayton. This made me really happy. Through interviews with one of my aunties, who visited Hamilton regularly, as a child, I learned that my great great grandmother, Grace Moors, went to an upstairs bedroom to feed one of her daughters. No one went into the bedroom and there was a great curiosity about her. After my great great grandfather John Moors passed away, according to records, in 1914, Grace and her daughter Alice both headed for the west coast in the United States to live with Alice’s sister, Rose, in San Diego, California. 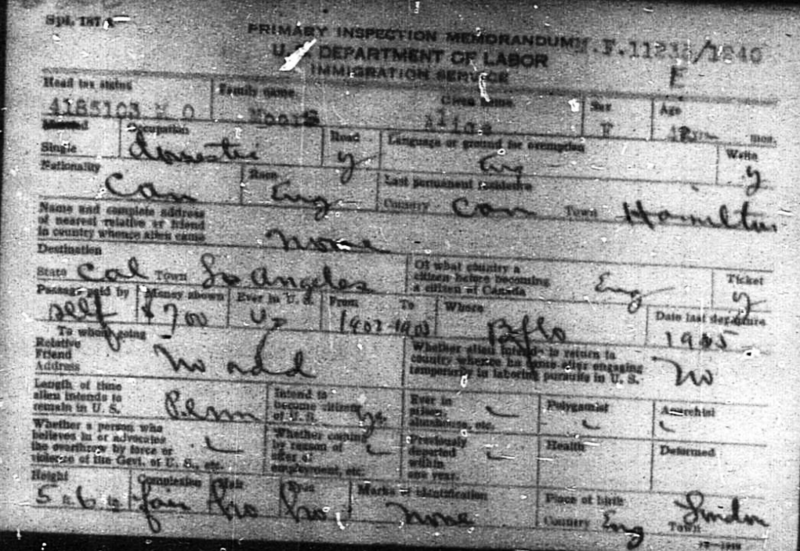 June 27, 1921 is the date that appears on the immigration records. Alice is a waiter living in Los Angeles and living at 336 Loma Drive. Her mother, widowed, is living on Florida. 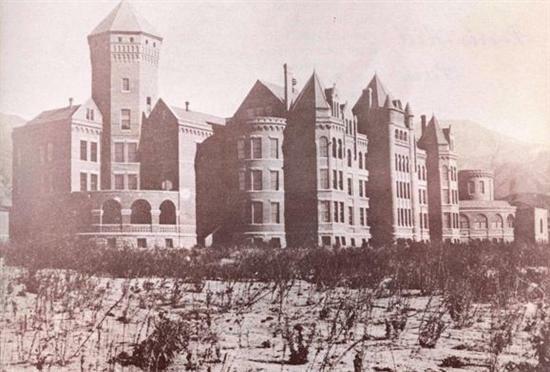 Unfortunately, it is not long and we find Alice in Patton State Hospital in Highland, San Bernardino, California. She is listed as a sewer in this record. This researcher has no idea what circumstances or history lead to this event, but it is an unfortunate one. 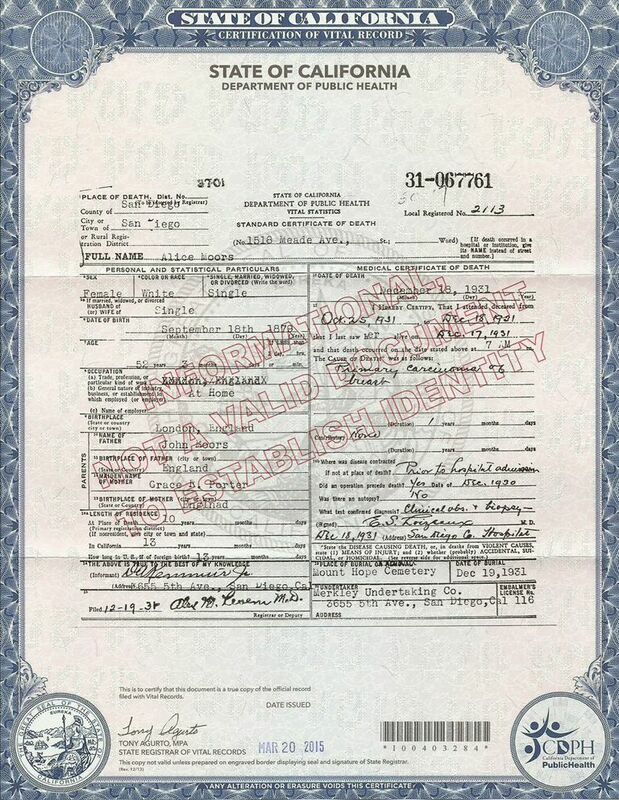 My cousin has generously written to California State who did release the death certificate for our great aunt and this might lead to further revelation as far as Alice’s medical history. 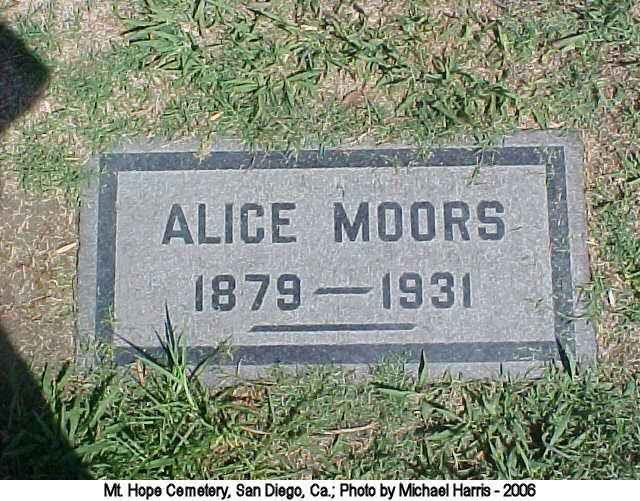 In the end, Alice is buried along side her sister Rose Clayton, her brother-in-law, Harry Clayton (a house painter in the area…likely moving to California for the grand opportunities it would afford) her mother, Grace Moors and sister, Grace, in Hope Cemetery, San Diego, California. Of the siblings, only John, Rose and Marion Ada married. Cause of death was listed as breast cancer. Four more hits on this page today…wondering who might be doing their research on Alice or some person related to Alice? Please contact me.